For those of you looking for a software update to your Samsung Galaxy S III, it looks like the Android 4.2 update is in the works, and we even have some new screenshots that look like they are showing what Android 4.2 will look like on Samsung's early-2012 flagship device. Unfortunately, we still don't have any idea when the update could be rolling out to users. As you can see in the leaked shots, the Jelly Bean update brings lockscreen widgets, Daydream mode, and the quick settings panel, which has been expanded on in TouchWiz. Instead of just the standard icons for brightness, settings, WiFi, cellular, battery, airplane mode, bluetooth, and alarms, there are also options for GPS, sound, screen rotation, Blocking Mode, Power Saving Mode, AllShare, multi-window, WiFi Hotspot, S Beam, NFC, Driving Mode, Smart Stay, and Sync. We kind of feel like that might be a bit of overkill on the settings toggles. Again, no word on when the update will be coming out, but Samsung has to coordinate with quite a lot of carriers, so it could take a while. Samsung is going to be the top Android dog in 2013.
eh, PA, there is a leaked JB 4.2.1 ROM on sammobile available since yesterday... and i happen to have it running on my S3... so yeah its true! Anyone else care to claim Samsung is slow to updates? Do I hear anyone else releasing 4.2 on their devices from last year yet? Nope! Anyway, this def looks legit and looks great, I really can't wait to see this on my unlocked Note 2.
those are nexus devices.they'l obviously be the first to get a new flavor of android.im sure he's reffering to OEM Android devices like HTC,LG,Samsung etc and the s3 getting android 4.2 is surely amazing.great value for money. this is just one example why samsung doing great than any other android manufactures.. I'm not going to flash the leaked ROM anytime soon until I see it's completely stable. If T-Mobile decides to roll it out before mid-April, I'll just wait. 4.1 --> 4.2 isn't a huge upgrade. Damn, Samsung is like a killer machine, always bringing new functions and tricks and keeps improving and innovating and and..... Way to go, Sammy Boy! I bet they will show like 100 new features when they present the S4, unlike HTC One who came up with... say 3 new features? The quick settings menu looks a lot more cluttered and doesn't look as clean as stock 4.2. Or is that just me? Its already configurable on S3 in 4.1.2, you can pick what icons you want to see. Only difference in screenshot is that now you can see all settings at once in multiple rows, instead of current way where you get a scrollable panel with 1 row on top. Can't wait to get this on my GS3. But I thought this update had a lot of bugs!? Yes, its overkill on the quick toggles. You should be able to choose the toggles you want. Which is why the first day I got my Galaxy S3, I installed a custom 4.2.2 ROM from Liquid Smooth. So Verizon should see this around Q1 2014? Excellent work by Samsung, they are actually crapping all over their competitors when it comes to updates, most 2012 flagships (majority being from poor Sony) do not even have 4.1 yet and yet here we are already sitting on 4.1.2 and about to get 4.2 : D looking forward to this. :) Sad day for Samsung haters. All 2012 flagships have 4.1, aside from LG and Sony's early flagships. Even some mid ranged phones from last year have 4.1 HTC; One X, One X+, Butterfly/DNA, One S Motorola; Razr HD, Razr Maxx HD, Razr M, Razr i, Atrix HD Sony (late models only); Xperia T and Xperia E LG; Optimus G It's only Sony and LG that are lacking, not any other competitor. 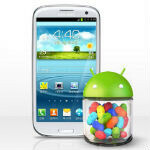 Right, then why did people cry over the buggy Jellybean update that the S3 got? I don't know if it might occur to you yet but other companies like to roll out the updates bug free. Also they do not introduce fatal flaws to the phones like the Galaxy S3 sudden death, or S2 emmc brick.